Target has been running a pretty great iPad promotion that you might want to take advantage of. This target trade-in iPad offer ends today though, so you’ll need to be quick if you want to grab $200 for your old iPad, so read on for further details. At the moment Target will pay you at least $200 for old original iPads and others. No, that’s not a misprint, but there is a slight catch as the $200 has to be put towards the purchase of a new iPad from target. Even so, you’d be lucky to find a better deal. Bearing in mind that many readers will be thinking of buying the new iPad Air for Christmas, this makes the offer almost irresistible. We can’t think of many other places that will give you $200 for a first-generation iPad and the offer also applies to other iPads as long as they will still power on and don’t have a scratched screen. This $200 offer for old iPads deal began on November 3 and runs through November 9, so make sure you head down there today and not tomorrow. After all $200 towards an iPad Air will give you a good head start on the cost. The $200 will be given to you in the form of a Target GiftCard as part of this in-store promotion. 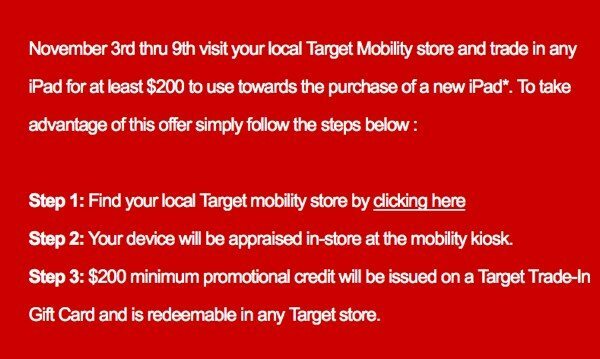 If you head to this Target page you’ll see full step-by-step details of what you need to do and you’ll see that the small print says you’ll get “at least” $200 to use towards a new iPad. We have a feeling that Target stores will be pretty business today as people take advantage of this offer before the promotion ends. Are you going to be heading down to your nearest Target store today? Were you planning on buying a new iPad anyway, so this Target trade-in offer makes it an even better proposition? Let us know by sending your comments.